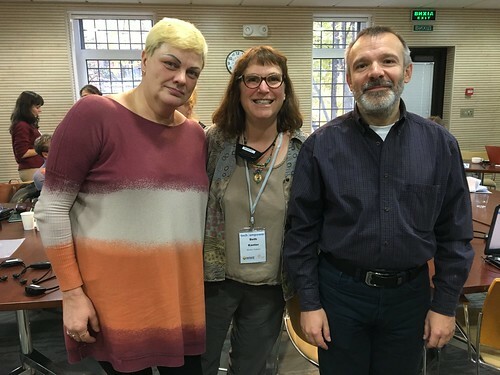 I’ve just returned from an inspiring week in Kiev, Ukraine where I got to facilitate a training for women’s organizations organized by Wake, an amazing start up founded by two respected colleagues Trish Tierney and Heather Ramsey. They started WAKE after working together for 15 years designing and leading global programs at the intersection of technology, civil society and women’s empowerment. The program is called Tech2Empower and you can learn more about it here. We had an incredible team of women tech advisers from Silicon Valley, all experts, and who taught classes on how to use various tools such as Google, Canva, and Indiegogo, complete with detailed work books with exercises. While I delivered some content sessions on Facebook, Twitter, and LinkedIn strategy, I also facilitated interactive sessions. 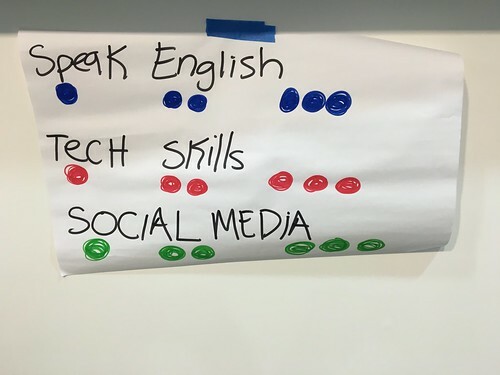 It is always challenge to use participatory techniques when your participants are not native English speakers and you don’t speak the language. You have to think of your interpreters as extensions of your facilitation techniques. I thought I’d share a few quick insights and tips that I learned for others who may be preparing for doing tech training internationally and want to use participatory techniques. While most of the tech experts used lecture, demonstration, and hands-on practice as their pedagogical approach and we did some pre-session surveys, it was still important for us to get to better understanding of the skill, knowledge, and mindsets of the participants once in the room. We were lucky enough to locate the training at the America House Kiev which offered the dream combination of great lattes, flexible space, state of the art equipment, and super fast internet. The first day the room layout was in small groups, to encourage knowledge sharing and co-learning. We had a very competent interpretation team of 3 people – who were the best team I’ve worked with and were able to do simultaneous translation. However, with interactive exercises there is a time lag – so I did a little exercise in the beginning to do some social engineering in the room. We had folks color code their name tags. For example, if they speak English really well, they were asked to put 3 dots on their name tags, two dots for okay, and one dot for just a few words or not at all. Then I was able to distribute the more fluent English speakers at different tables so they could help with translation. We did the same with the technical skills, so the seating at the tables included a mix of skills levels which empowers more advanced people to assist others. While most of the instruction was done as a full group, we also wanted to allow some less structured time for people to self-organize into small groups and get hands-on time at their own pace and specific questions answers. This was towards the end of the training, so we were able to get assistance from participants to create a bilingual set up, have people sign up, and then spread out for coaching sessions. We allowed people to move from group to group once they go their questions answered. Small group coaching has it own specific techniques. For example, getting participants to share their questions, so you as the coach can clarify their information needs and organize the coaching for the different levels you might have seated around the table. With non-English speaking participants, there is an extra layer of back and forth. When you have a beginner or novice technical level, combined with not speaking English you have work harder, but it can be done! I coached this participant, with the help of the translator on getting her brand page set up! If you are using PPT, it is helpful to include your bullet points in the notes sections ahead time. This helps the interpreters prep. When on site, make sure you introduce yourself and ask for any clarifications of language or ideas. I always like to work out some hand signals. The thumbs up means the pace and language is good. The waving downward is slow down. You have to remember that there is about 10-15 second delay – and they typically translate in phrases. Visualize ocean waves coming into the shore. If there are multiple trainers, it helps to listen to the rhythm of the interpreters before you speak so you can adjust your pacing. Speak at half your normal speed. Try to speak in complete sentences and keep it simple. If you are also demonstrating how to steps for the technology on the screen, go even slower. One technique is to have someone else actually do the hands-on demonstration while your speaking which naturally causes you to slow down. And, make sure that interpreters can also see the screen – it is hard for them fly blind. Avoid jokes, slang, and long complex sentences. Try to maintain a consistent speed in your delivery. If you speed up or slow down mid-sentence, this makes it hard for the interpreter to keep in sync with you. Try not to get excited or too dramatic. And don’t cough or sneeze into the mic as your voice is in their headsets at all time. I learn a lot more which I’ll save for another blog post. I tend to take a lot of photos to document the training approaches and use that for reflection to improve training techniques. But one thing that I just loved was our group photo. We took a photo in the stairwell and you might see me with my iPhone up. 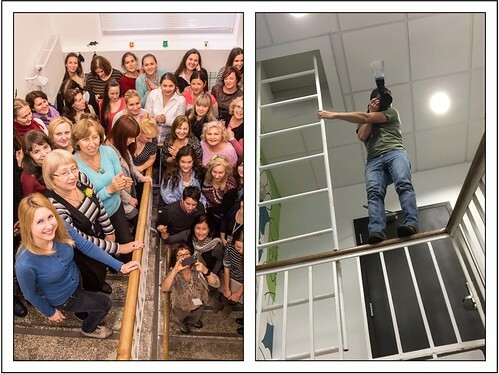 I was photographing the photographer who was balanced on a stair railing! 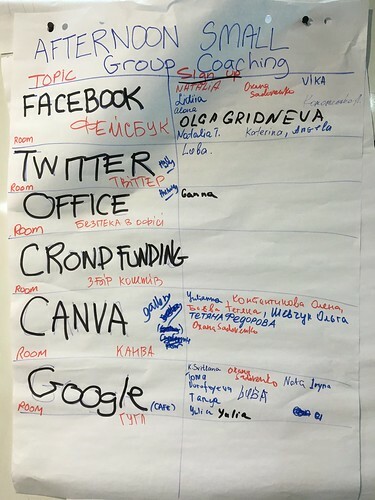 If you have facilitated training internationally and used participatory facilitation techniques, what tips or insights do have to offer? Great tips, Beth. Having worked with interpreters at trainings and presentations, I concur with all of your points, and found especially that thinking and speaking in phrases, rather than words or paragraphs was the key for me. It takes getting used to. And I realized how much of what we say is idiomatic or slang. Thank you for addressing this subject so well. It’s true that the more information we have ahead of time (PPT and subjects to cover) the smoother the delivery and the better the result. And yes – reading a document takes more time than interpreting, so glad you mentioned that! What other tips would you add? What type of interpretation do you do? Can’t wait to hear about your experience in Japan.